Kentucky Public Retirees President Judith Lesher, left, delivered donations to Linda Funk at Warm Blessings Soup Kitchen in Elizabethtown. 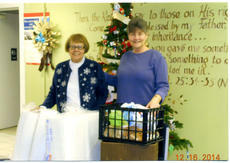 Members collected personal hygiene items and Styrofoam plates in November and December for the kitchen. I have three friends who are going through a difficult time. One is in the hospital with double pneumonia, one just had knee replacement surgery, and another, as well as her friend, are going to have kidney transplant surgery. One friend is donating her kidney to another. All of these asked me to pray for them. The Bible speaks of a friendship between David and Jonathan. Their friendship is one of the deepest and closest recorded in the Bible (I Samuel 18:1-4). We each are committed to God, not just each other. True friends will draw closer together when problems come. Tyler Foster’s fort, built by his Papaw Ronnie and Uncle William, turned into a snow fort when Winter Storm Octavia passed through LaRue County. LaRue County’s Relay for Life will begin at 1 p.m. May 30 on Lincoln Square. The event ends at 1 a.m. the next day. For more information on forming a team, call Kathy Ross at 270-234-3309. Living Strong’s Adopt-A-Pig Project is going on through April 25. Adopt a plastic pig and enter a variety of contests to support Relay. For more information, call Kathy Ross at 270-234-3309. Elizabethtown Community and Technical College has announced the names of students who made the Dean’s List and the President’s Honor List for Fall 2014 Semester. The President’s Honor List is awarded to full-time and part-time students who are earning a 4.0 grade point average and successfully completing at least 12 hours of course work (full-time) or cumulative 18 credits for part-time. Leadership LaRue County will award a $500 scholarship to a graduating senior from LaRue public or private schools, or an adult wishing to begin an educational program. Essay, high school transcript and letters of recommendation required. Application available at LCHS guidance counselor’s office or The LaRue County Chamber of Commerce. Deadline is April 1. The hometown of Abraham Lincoln will play host on March 13 to 13 Republican candidates for state office. The candidates have confirmed attendance at the LaRue County Republican Party’s chili supper at 6:30 p.m. at the Hodgenville Woman’s Club. Several LaRue County students have distinguished themselves academically at the University of Louisville. Jasmine R. Dickerson earned a bachelor of science in the fall 2014 semester. Several students were named as dean’s scholars or to the dean’s list in December. Generally, a student who is a dean’s scholar has a 4.0 grade point average and a student named to the dean’s list has a 3.5 grade point average. Dean’s Scholars – Chelsea Elizabeth Blair and John Ross Slack. 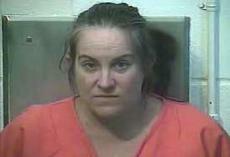 A Hodgenville woman is facing two counts of wanton endangerment after allegedly pointing a gun at a couple. According to LaRue County Deputy Brian Smith, dispatch received a call at 1:41 p.m. Feb. 28 about an alleged altercation on Shawnee Drive in Hodgenville. His report stated that Carrie E. Bowen, 42, was sitting in a parked car beside an automated teller machine at Lincoln National Bank on Shawnee Drive. Sheriff Russell McCoy said a car pulled up behind Bowen. When she didn’t move, the driver blew the horn.